You are here: Home / Blog / Dirt roads, clean water and national forests? Washington Watershed Restoration Initiative to the rescue! Dirt roads, clean water and national forests? Washington Watershed Restoration Initiative to the rescue! Washington Watershed Restoration Initiative - focusing on maintaining important roads to minimize impact on forest ecosystems. Passage of the Northwest Forest Plan in the mid 1990s was a turning point for conservation. Not only did spotted owls and salmon begin to have a chance at survival but the land and water they depend on were given the ability to heal. Federal, state, local, private landowners across the state stepped up to do their part and everyone lived happily ever after. Right? Well, not exactly. In 2006, six years after the Forest Service signed an agreement with the Washington State Department of Ecology (WSDE) to bring its roads up to standard by 2016, little work had been done. SWDE – as the administrator of the Clean Water Act in the state – was obligated to do something. State and large private timber landowners were well underway with meeting their road agreements in the Northwest Forest Plan, but federal lands were falling far behind. Instead of slapping the federal forests with fines, WSDE joined a coalition of state agencies, tribes and recreation/conservation NGOs (including The Mountaineers) – which became the Washington Watershed Restoration Initiative (WWRI). The coalition agreed that the Forest Service wanted to uphold their agreement – they just didn’t have the funds to do so. The WWRI met with Congressman Norm Dicks and soon “Stormin Normin” was providing the lead (and Congress followed) to secure federal funding for road management. The Legacy Roads and Trails Remediation program (LRT) began! This funding provided the Forest Service the help they needed to get started. In the first year, Congress appropriated $40 million to the program, of which $3.5 million came to forests in Washington State. But how does this program help clean water? Forest roads were first built decades ago to access timber harvest sites and were not designed to last forever. With all the rainfall in Western Washington, water is a problem. Water runs along ditches along the sides of the road, over the road, through culverts under the road and often pours straight into streams – carrying all the dirt it picks up along the way. This can add up to dumptruck after dumptruck of sediment, which not only pollutes the water but buries spawning grounds of threatened salmon. Because these roads are old and often built in the wrong places, when winter storms come through, the roads can wash away or become victims of landslides. Dirty streams, buried fish eggs and loss of access to trails and campsites – rather bleak picture. road maintenance and storm-proofing projects – to increase the ability to ‘weather’ powerful storms and ensure access to places we love. road decommissioning projects – to remove unneeded roads and reduce the delivery of sediment to streams (often these roads are spur roads or old roads that are already closed). road relocation projects – to move roads out of the floodplain where they can be washed out. aquatic passage projects – to replace small culverts under roads with much larger culverts which allow fish to move easier up and downstream (and also improves the roads resilience during a storm). bridge projects – to replace old bridges with newer bridges that are safe for our cars to use. 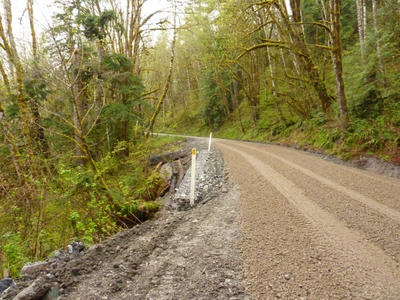 trail projects – to maintain/improve trails or convert roads to trails where it makes sense. Before: Mt. Loop Highway in the Mt.Baker-Snoqualmie National Forest. By the white poles on the left is a culvert that was rusted out. The road slope was caving in, making the roadway too narrow and adding sediment of the river. After: LRT dollars were used to replace the rusted culvert with a bigger one that can handle more water during storms and will prevent the road from washing away. The side of the road was reinforced with a rock wall to gain back road width and make it safer to drive. Legacy Roads and Trails is not a permanent program. Each year the WWRI coalition shows its support and encourages our Senators and Congresswomen/men to continue funding for the program. In last years budget, the program was cut by 22%, which makes it even more difficult to get projects done. Ongoing, reliable funding is desperately needed. 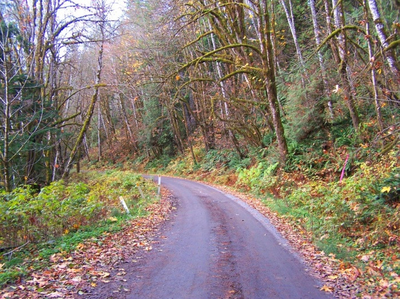 Contact Senators Murray or Cantwell, or your Congressional representatives and let them know you recognize the problem, you use roads to access many places in federal forests, and you support adequate funding for Legacy Roads and Trails. Be another set of eyes for the Forest Service: with thousands of miles of roads, they can’t keep track of everything. If you see a plugged culvert or road washout or other road maintenance problem, let your local district ranger know. For more information and numbers on these issues and project, visit the WWRI website or read this report on the first five years of the Legacy Roads and Trails program.